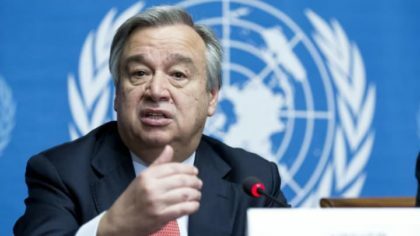 A two-State solution where Israel and Palestine live side-by-side as sovereign nations is still “the only option” for lasting peace, and “containing the situation is not sufficient,” United Nations Secretary-General António Guterres said on Wednesday. Containing the situation is not sufficient, he said, calling “on all actors, and first and foremost the leadership of Israel and the Palestinian Authority, to take bold steps and restore faith in the promise of General Assembly resolution 181, of two States living side-by-side in peace and security”. This would fulfill the legitimate national aspirations of both peoples, with borders based on the 1967 lines and Jerusalem as the capital of both States ‑ East Jerusalem being the capital of the Palestinian State, he said. The United Nations will not waver in its commitment to the Palestinian people. On this International Day of Solidarity, let us reaffirm our commitment to upholding the rights of the Palestinian people and to building a future of peace, justice, security and dignity for Palestinians and Israelis alike, he said. He urged in this connection Israel to lift restrictions on the movement of people and goods, which also hamper, he said, the efforts of the United Nations and other humanitarian agencies.